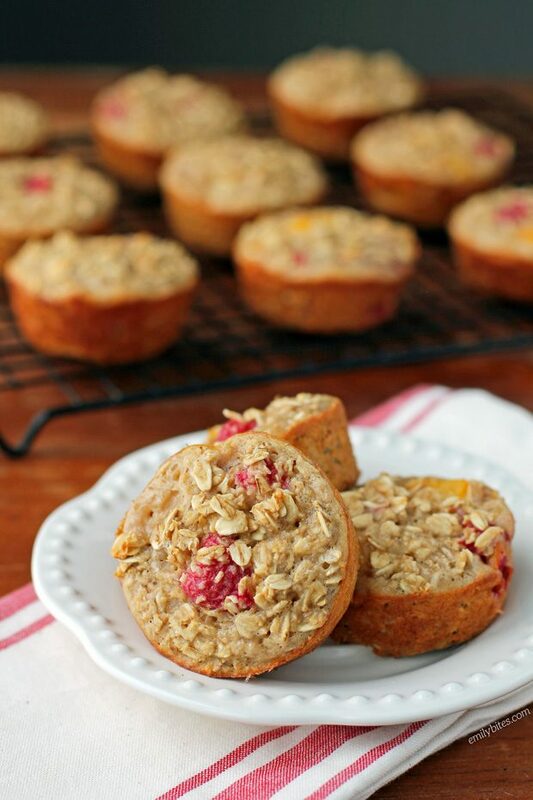 These Raspberry Peach Baked Oatmeal Singles are such a fun mix of flavors and a great way to start your day. They’re healthy, filling, fruity and just 97 calories or 3 Weight Watchers SmartPoints each! If you have followed me here for any amount of time you probably already know I’m kind of obsessed with making baked oatmeal in my muffin tin, and once you try it I know you’ll see why. 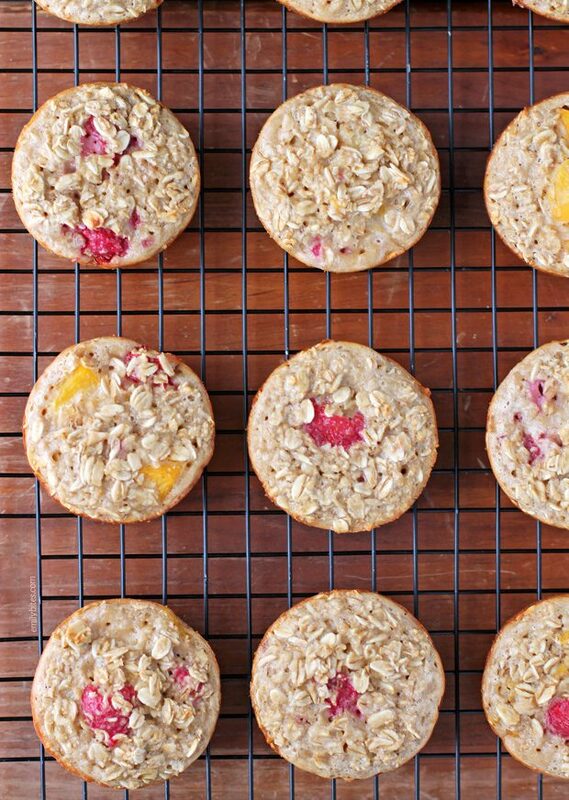 These Raspberry Peach Baked Oatmeal Singles take just a few minutes of prep time and then you just toss them in the oven and voila! Breakfast is served. It’s so easy to grab these to bring to work or wherever you need to go. Portable, delicious, easy and healthy…what are you waiting for? Looking for more baked oatmeal recipes? Try my Orange Cranberry Baked Oatmeal Singles, Pear Gingerbread Baked Oatmeal Singles, Strawberry Banana Baked Oatmeal Singles, Blueberry Baked Oatmeal Singles, Banana Chocolate Chip Baked Oatmeal Singles, Carrot Cake Baked Oatmeal Singles, Apple Cinnamon Baked Oatmeal Singles, Pumpkin Chocolate Baked Oatmeal Singles, Chocolate Cherry Baked Oatmeal Singles, Pumpkin, Cranberry & Apple Baked Oatmeal or Blueberry Peach Baked Oatmeal! Preheat the oven to 350. Lightly mist 12 cups in a muffin tin with cooking spray. In a separate bowl, whisk together the egg white, egg, milk, yogurt and vanilla. Add the wet ingredients to the dry ingredients and stir until blended together. Stir in the raspberries and peaches. Spoon the oatmeal mixture evenly between the prepared muffin cups. Bake uncovered for 22-25 minutes or until oatmeal is lightly browned and a toothpick inserted into the middle comes out clean. Have you tried freezing them? I freeze them all the time, just wrap each one in plastic wrap and then place in a ziploc bag. I pull them out the night before and microwave for 15 seconds… taste like they are fresh from the oven! Have you tried any other flavors, strawberry or blueberry perhaps? I just can’t wait to make this today. I was thinking making baked oatmeal muffins this week for next week and something just told me to check out this site. Is there a way to make this dairy free? I use almond milk .. and it lowers the points. I also add nuts for some protein. I have made many of your muffin recipes, but these seemed like there was too much moisture in them, and the bottoms never seemed to cook. Any advise, I like the combination of flavors. Thank you. Have you tried substituting Stevia for the Brown Sugar? Maybe some of it… always looking to save a few calorie? I’m sorry, I’ve never baked with stevia so I can’t give any direction as to how it would work in the recipe or how much to use. If you try it I hope it works out great! OMG…..I just made these for the first time and it won’t be the last! Love recipes like this where they are easy to make and tastes good too. Thanks for sharing and I’m looking forward to making more of your recipes. It is wonderful dish and just want to taste. I apologize if this has already been mentioned/discussed, but could you substitute the splenda brown sugar and cut down on the points/calories?